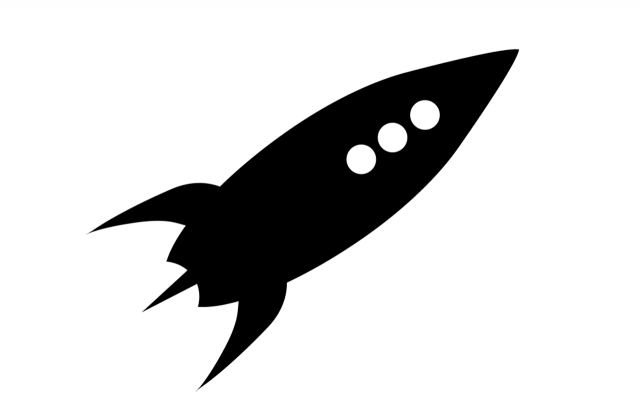 Here’s an old project I never wrote about… Every now and then I just experiment with things, and this piece started with using Inkscape for an illustration of a rocket. Here it is. Pretty boring! 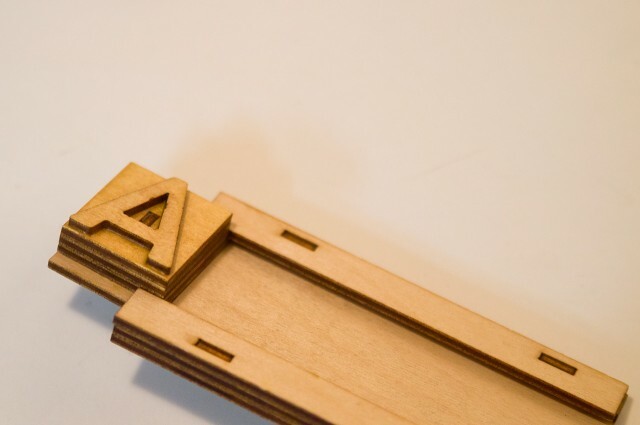 Since I tend to think of any illustration as cutting paths I tend to avoid strokes and just use solid objects, which comes in handy, especially if you decide to use digital fabrication techniques to create things. I next took my illustration, which was essentially a two-color design on a black background) and created color separations. One for the silver, and one for the red. I then created DXF files I could load into Silhouette Studio so I could cut stencils and paint the scene onto an 8″ x 8″ canvas. (Yes, sometimes I mess around with paint.) You might also notice I added registration marks, these are things you learn from years of working in the print industry and printmaking. 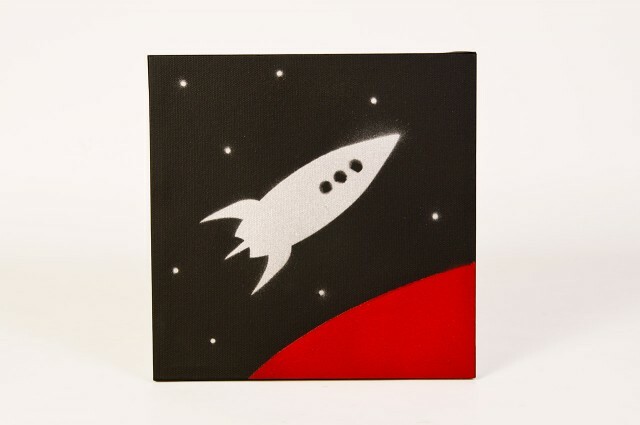 Here’s the result of cutting two stencils and spray painting them onto a black canvas. It turned out okay, but I didn’t love it. (Probably because I don’t love painting.) 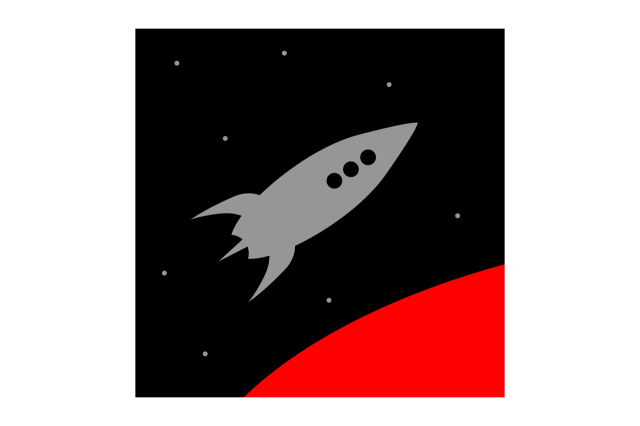 What I do love is the fact that with vector artwork it’s easy to scale things, so I did. 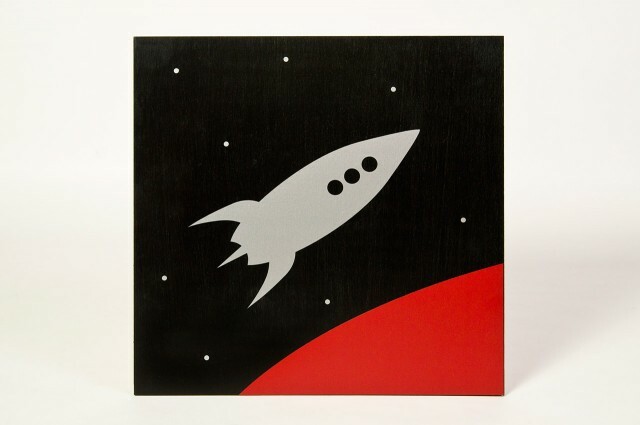 Here’s a 12″ x 12″ version of the artwork, but this time I used a piece of painted wood and just applied cut vinyl to it. I really like how this one turned out. In fact, it’s hanging in the shop right now. 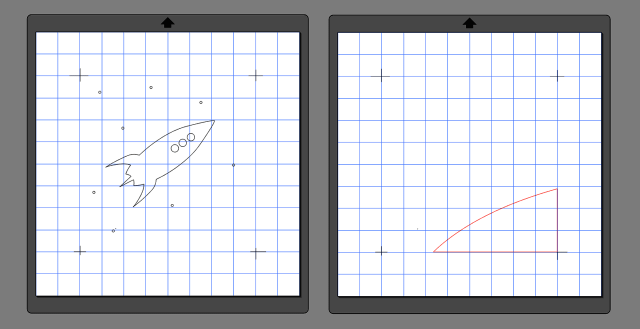 Sometimes I get so caught up in creating 3D (or 2.5D) work that I forget how much I like doing 2D stuff. I should probably do more in the future. 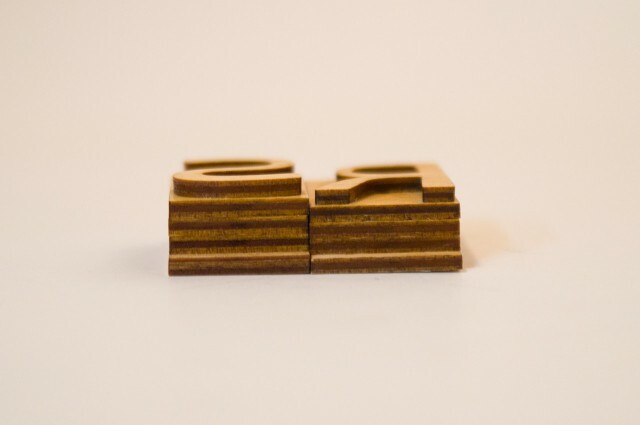 “LaserCut LetterPress” (for lack of a better name) is a project I worked on in 2014/2015 which was an idea to create a full letterpress set using a laser cutter capable of cutting 3mm Baltic Birch plywood. 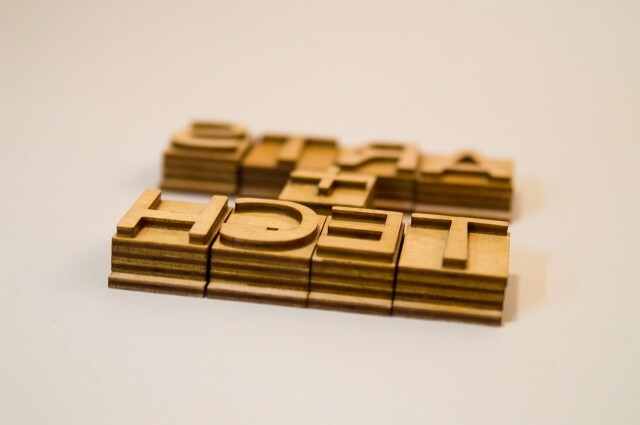 The idea was that the files would be released that allowed anyone with access to a laser cutter (even lower-powered cutters with small beds) to create the set. I mentioned some of the process in a post titled Measure Twice, Laser Once… but never wrote up the whole thing, so here we go. 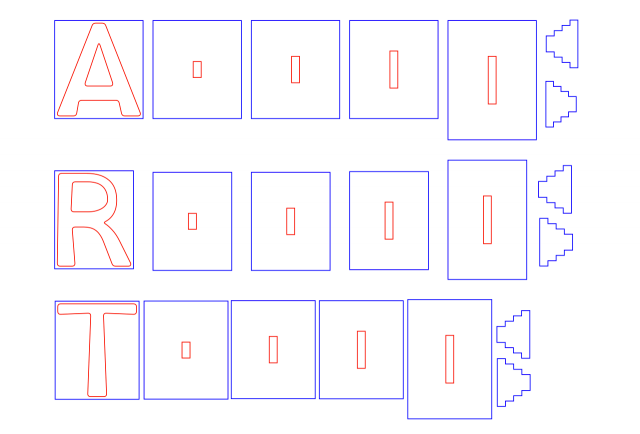 The typeface I chose was OpenDyslexic, which was inspired by a friend who is Dyslexic. I also thought it would be interesting to use a typeface that was new, and didn’t exist in the time that wooden type was widely used. 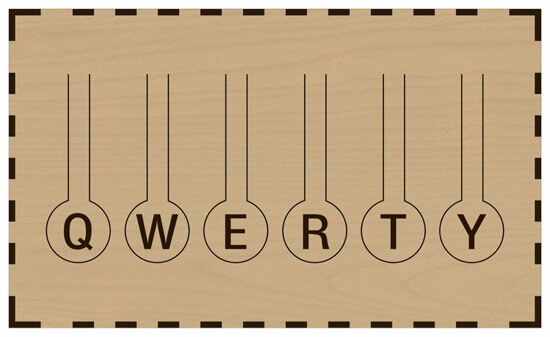 I did the design in Inkscape, creating the letter and the pieces that fit under the letter so it could slide into a tray. Here’s the design for the small tray. Ultimately I wanted a larger tray that had multiple lines so you could do an entire poster. That of course would have required an entire alphabet, and multiples of most letters, and punctuation, and… letterpress is hard. Oh, somewhere along the way I also started to write code that would generate all the characters needed by outputting the needed SVG files. In theory it was totally doable, but in practice it served as a distraction that I eventually ignored. 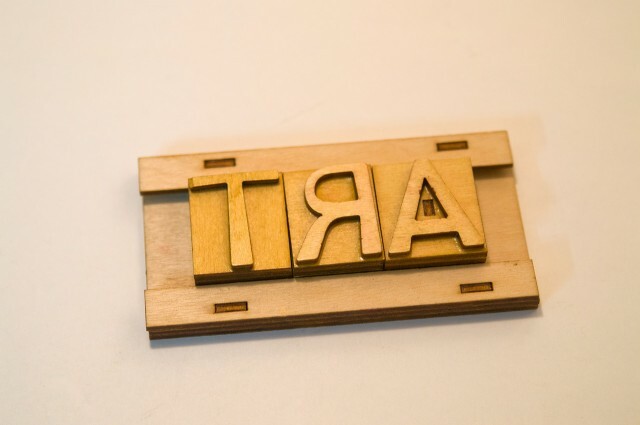 Here’s the letter “A” sliding into the small tray I made. Tolerances were good with the first batch of letters, but with subsequent pieces not so much. …and you can really see it with these. Yes, this is all 3mm wood. Again, as mentioned with the previous post, there can be quite a difference when the layers add up. I did manage to create enough letters for one of the Arts + Tech Nights at UWM. 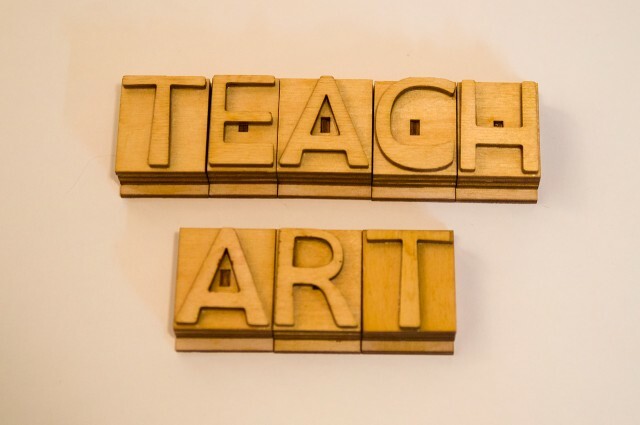 And oddly enough, I was able to arrange the letters into “TEACH ART”, which I ended up doing six months after I abandoned this project. Here’s a few test prints I did. They worked fine, which made me think I may have overthought how “perfect” it had to be. 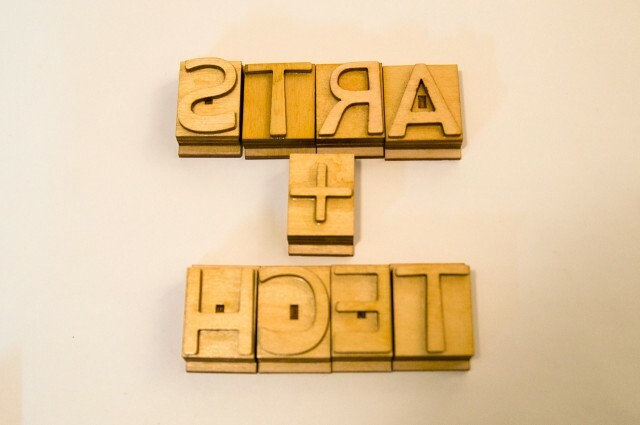 In the process of talking to printmakers (who were very interested in the project) they got me thinking about type height, which is useful for a press (and I considered using these letters on a press) but in the end I think I should have stuck with my “hacker ethic” and just made it work with the minimal amount of success. I don’t consider this a “failed” project because I learned a lot in the process (and got to meet & work with some awesome people) but I’d love to see someone else run with this idea… or maybe it’s something I’ll pick up again in one form or another. Remember kids, Keep on Making! Years ago my grandfather had shop in the basement, and he made things. He made doll furniture, and (wooden) snow shoes, and household items, and of course, lots of sawdust. My dad also had a work shop, and made many of the same things, and also made full-size furniture for our house. They both invested in tools over the years to make things. If you’re a Maker (and they both were) sometimes the joy is in the making… in the process… but it can also be the joy that comes from giving a gift to someone that you made yourself. I like making things as well. Sometimes I just use my hands and some tools and whatever raw materials are on hand, but I also really like designing things using software that can then be fabricated by machines. I don’t consider this any less “making”, by the way. 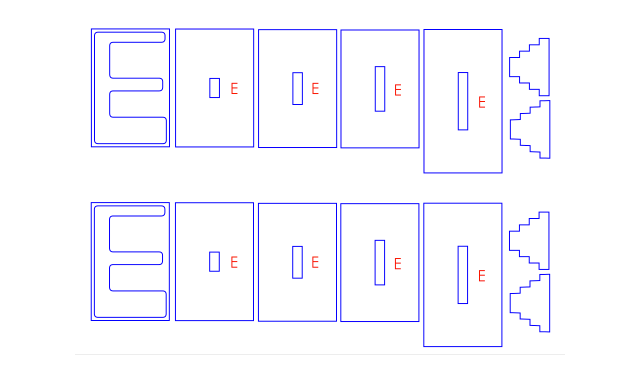 I think I enjoy designing useful things in the same way I used to enjoy writing code. There was a problem to be solved, and if I could do it, or help do it, I would… and if solving a problem once for yourself can solve it for others in the future, even better. Most people agree that it doesn’t make sense to solve a problem that’s already been solved. 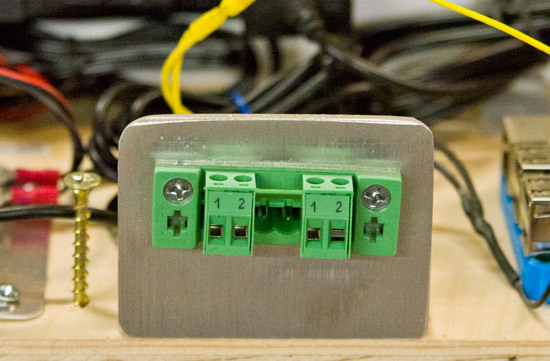 During a recent project someone needed to mount this Phoenix Connector to something, and a piece of Aluminum was found, and a square(ish) hole was made, and some holes were drilled, and there was probably some filing involved, but in the end, it worked, and that’s fine. In my mind though, this was a problem that could be solved by designing and fabricating a part. 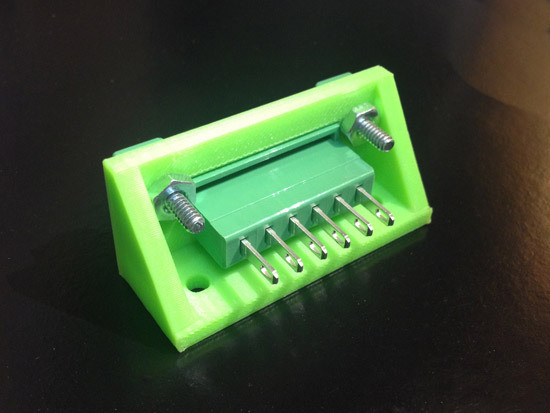 Now, if this was a one-off, it might not matter as much, but if we build another one of these things, or use these connectors again, why spend time cutting and drilling and filing a piece of metal when we’ve got a 3D Printer in the shop? 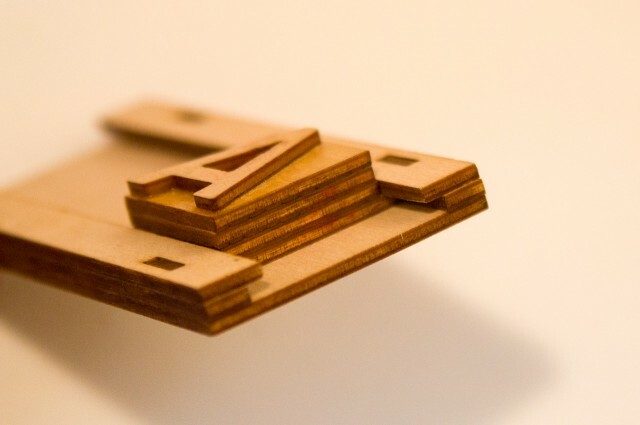 To me, the promise of digital fabrication isn’t always about doing it the fastest, or the cheapest, but it’s about precision and repeatability. If Bob down in the shop can crank out a mount in 10 minutes, and it’s good enough, that’s great. But if Ted, and Laura, and Tim can take a file that I designed, and spit one out with a 3D Printer on a whim, and it’s the same every single time, that’s valuable. The knowledge and skill needed to create something is shared and distributed. Long after Bob and Ted and Laura and Tim leave the shop, someone could still make the thing, multiple times, precisely, because the problem was solved long ago. I’m not dismissing hands-on making skills, or in any way suggesting digital fabrication is always a better choice, but in some cases, I think that if applied properly it can make things… better. 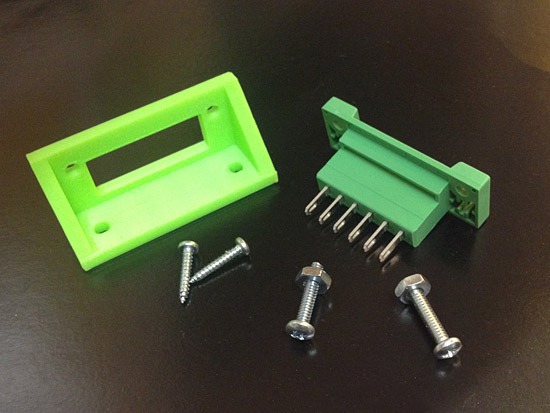 You can find Phoenix Connector Mount on Thingiverse and Youmagine. I’ve always been fascinated by typewriters. I find them to be curious machines, and their history is no less interesting. (Go on, take a look!) Of course I’m also fascinated by digital technology, and how it empowers people to creating things. 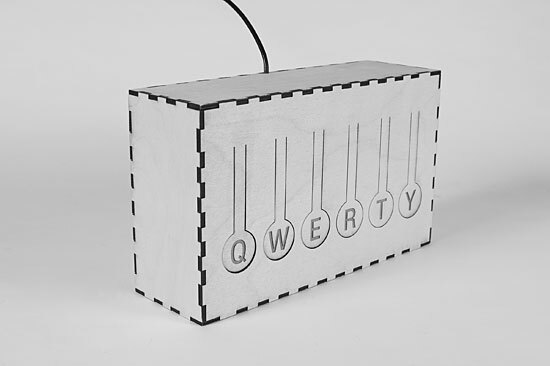 Above is a rendering of a QWERTY keyboard, and below is an actual QWERTY keyboard I created using digital fabrication and a tiny computer called a microcontroller functioning as the “brain”. The keyboard is fully-functional. 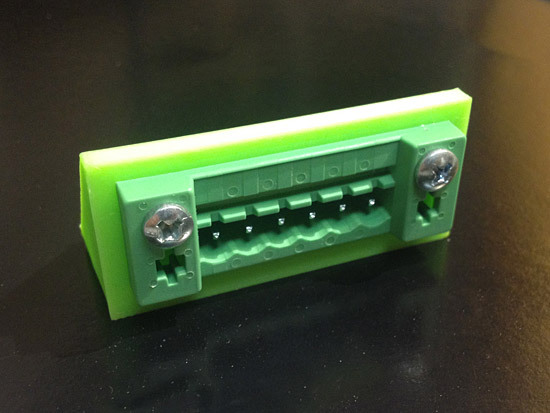 Plug it into the USB port of your laptop or desktop computer and you can start typing. Of course you can only type the letters Q, W, E, R, T and Y… but it does work. Like all of the things we use, it has limitations. Like all of our technology, it doesn’t do quite all of what we’d like it to do. 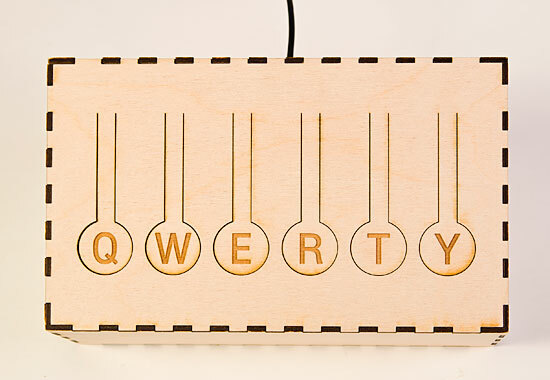 The QWERTY Keyboard is made from wood. 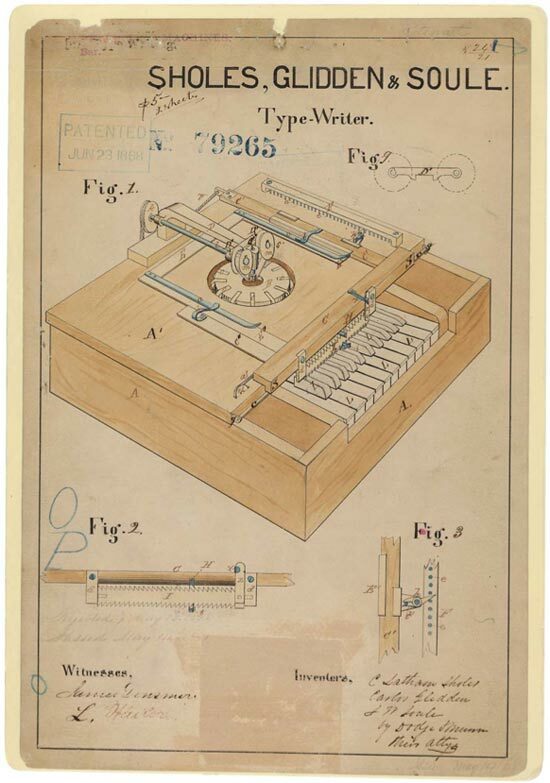 (Just like the early prototype of the Sholes, Glidden & Soule typewriter seen below.) My father was good at working with wood, and his father before him was probably even better at it. I am not that good at working with wood, but I am good at creating things digitally. There is perhaps an inverse skill scale at work here. Are we losing the ability to craft real-world objects in exchange for creating digital objects? 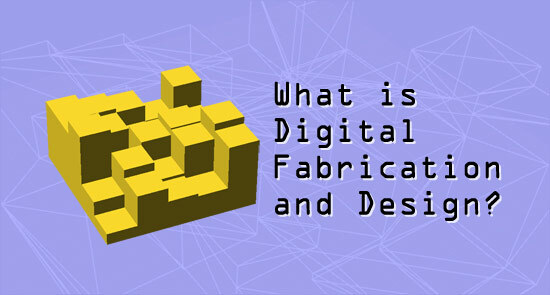 Maybe digital fabrication is the answer, bridging the gap between the two. The Sholes, Glidden & Soule typewriter is a weird looking device, as is my QWERTY keyboard. I think there’s a place in the world for both of them, and perhaps a place where the two can meet. 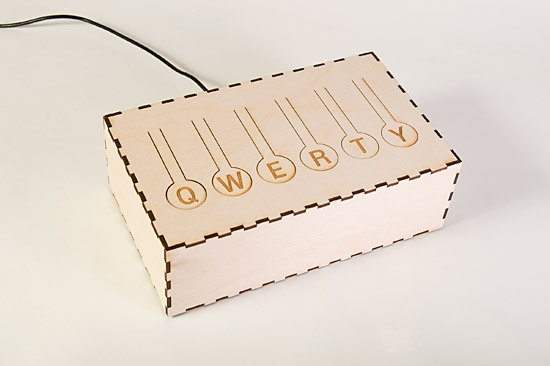 For more information on this piece, visit the QWERTY Keyboard project page. There are more thoughts and more photos, and as always, I welcome your comments. The first artist we had visit UWM for this year’s Artist Now! talks was Charles Beneke. His work tends to be in the areas of print-making and multi-media, but he did mention that he’s used laser cutters for some of his work. Charles seemed to indicate that the laser cutter was just a way for him to speed up production. This isn’t the first time I’ve heard this from an artist. 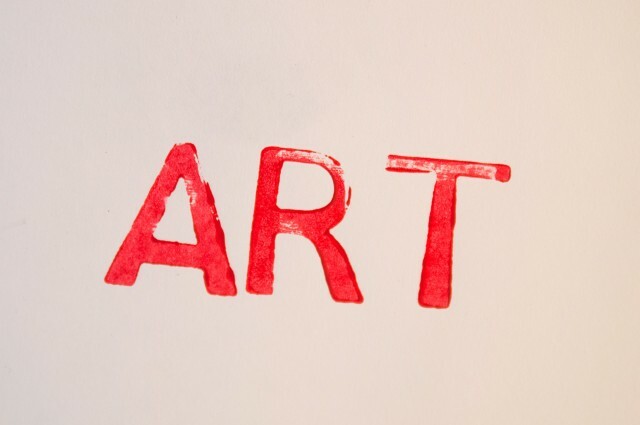 Many artists seem to look for ways to make their current process easier, or faster, or both. Instead of cutting things by hand, they want a machine to cut them. 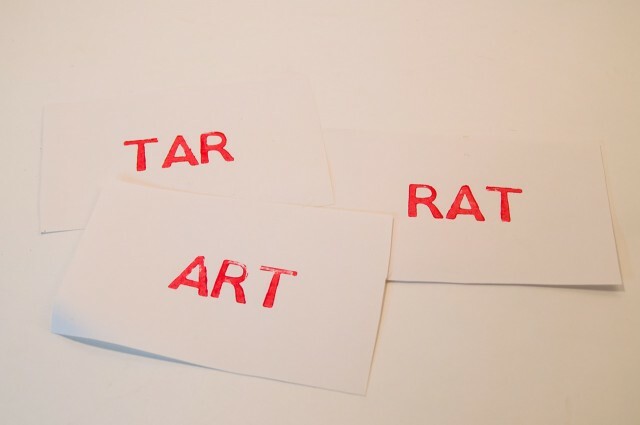 Most of these artists don’t seem to view the laser cutter as a unique and primary tool to create work, but just a more advanced method of what they’d do anyway, with their own hands and a sharp blade. In most cases though, these artists (and designers) are digitally designing things, and then using CNC machines to do at least a part of the production process, though I’m not sure any would say that they are working in the area of Digital Fabrication and Design.